Salisbury, MD: The Downtown Salisbury Festival – presented by Toyota – returns to Downtown Salisbury this June 8-10, 2018, complete with rides, great food, arts & entertainment and more! This year the action will take place along E. Main Street and E. Market Street, with all new carnival rides. 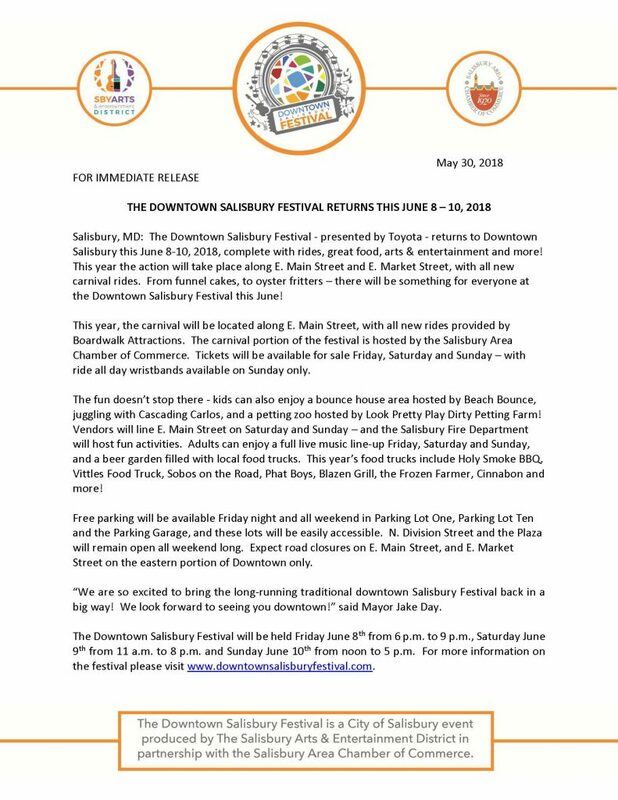 From funnel cakes, to oyster fritters – there will be something for everyone at the Downtown Salisbury Festival this June! This year, the carnival will be located along E. Main Street, with all new rides provided by Boardwalk Attractions. The carnival portion of the festival is hosted by the Salisbury Area Chamber of Commerce. Tickets will be available for sale Friday, Saturday and Sunday – with ride all day wristbands available on Sunday only. The fun doesn’t stop there – kids can also enjoy a bounce house area hosted by Beach Bounce, juggling with Cascading Carlos, and a petting zoo hosted by Look Pretty Play Dirty Petting Farm! Vendors will line E. Main Street on Saturday and Sunday – and the Salisbury Fire Department will host fun activities. Adults can enjoy a full live music line-up Friday, Saturday and Sunday, and a beer garden filled with local food trucks. This year’s food trucks include Holy Smoke BBQ, Vittles Food Truck, Sobos on the Road, Phat Boys, Blazen Grill, the Frozen Farmer, Cinnabon and more! Free parking will be available Friday night and all weekend in Parking Lot One, Parking Lot Ten and the Parking Garage, and these lots will be easily accessible. N. Division Street and the Plaza will remain open all weekend long. Expect road closures on E. Main Street, and E. Market Street on the eastern portion of Downtown only. “We are so excited to bring the long-running traditional downtown Salisbury Festival back in a big way! We look forward to seeing you downtown!” said Mayor Jake Day. The Downtown Salisbury Festival will be held Friday June 8th from 6 p.m. to 9 p.m., Saturday June 9th from 11 a.m. to 8 p.m. and Sunday June 10th from noon to 5 p.m. For more information on the festival please visit www.downtownsalisburyfestival.com.